This essay was posted on Rhapsody.com’s Music Stuff Place blog on May 25. I wrote it for my Rap Is Not Pop column. Judging from these and other recent albums like Kid Cudi’s Man on the Moon: End of Day, the vaunted new generation of MCs tends to treat rhyming as just another element in a pop-oriented package. However, Sage Francis’s Li(f)e, Talib Kweli & DJ Hi-Tek’s Revolutions Per Minute, and Nas & Damian Marley’s Distant Relatives prove that rap – or at least music where rapping, not singalong hooks, is the primary focus – can still yield critical and commercial rewards. Not coincidentally, all three came of age during previous generations. Nas emerged in the “fast rap” era at the start of the 90s. Talib Kweli came of age during the underground renaissance of the mid-90s, and Sage Francis debuted when that renaissance yielded a groundswell of indie artists at the start of the century. Kweli and Nas’ new albums will most likely appear near the top of the charts, disproving industry cynics that claim mainstream listeners – or, more pointedly, teenage girls – don’t buy traditional hip-hop albums anymore. Hip-hop is at its best when artists shift from the personal to the universal, whether the former is promoted with braggadocio or the latter is just sloganeering and metaphors. Francis is the least known of this trio, although he records for a major-indie (Anti- Records, a division of Epitaph) and packs nightclubs around the country. He’s often accused of preaching to the converted, and appealing to a white, left-leaning crowd of backpackers. But Li(f)e is not only an argument against conformity and groupthink, but an exercise in self-analysis over wry, sympathetic arrangements performed by post-rock band Califone (and written by the late Sparklehorse, Chris Walla of Death Cab for Cutie, and others). On “I Was Zero” he admits, “I’m debating the value of a caste system/ Cashback rewards and wars funded by my tax income/ If I’m a part of the problem, then pardon me/ There’s always been a difference between what I am and what I ought to be.” Maybe Francis’ critics don’t like the journey he makes before reaching his conclusions. Or maybe they don’t like the conclusions. Francis, Kweli, and Nas often get accused of the same things – bad beats, corny punch lines, and nonsensical verses. But the problem may be that we’ve grown used to formulaic rap, the kind that comes with a promise to buy us diamonds and rings, make love to us on satin sheets, and is frequently interrupted by a Trey Songz chorus. These artists’ albums require more imagination than that, and offer torrents of words that, like a good book full of uneven chapters, don’t always add up to hip-hop quotables. The major question of 2010 is whether a mainstream audience can appreciate such complexity anymore. 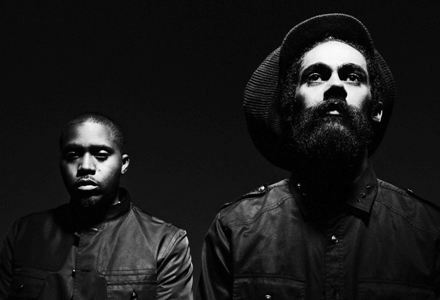 This entry was posted in News and tagged Damian Marley, Hi-Tek, lyrics to go, Nas, rap is not pop, Reflection Eternal, Rhapsody, Sage Francis, Talib Kweli, true school. Bookmark the permalink.